Wine was plentiful on the French front, and the image of the poilu and his wine is ubiquitous in French depictions of the war. Today, he forms a part of the French national myth. Members of the current French wine industry claim that the war experience turned poilus from diverse regions of France (especially those from regions with high beer consumption) into wine consumers. Wine supposedly contributed to France’s “national unity.” Vintners argue that the shared experience of the trenches–wine included– pushed aside regional differences. When I visited French World War I sites such as Verdun, I was struck by how often images of the poilu and wine were present. This message from the French president calls on the French populace, including women, to battle a postwar epidemic of alcoholism. This is depicted as a threat to France as grave as that once posed by Germany. The war’s outbreak also coincided with France’s ban on absinthe. Long the scapegoat of moral panics (and subject of countless depictions in the arts), absinthe was finally banned on August 16, 1914. In her book on the topic, Doris Lanier notes that many consumers circumvented the ban, and soldiers continued to enjoy absinthe during the war. The French government nevertheless justified the ban by claiming that absinthe was contributing to an epidemic of alcoholism, which was weakening France’s population. Although the language used by both government officials and the French press during this time is similar to language used by American Prohibition advocates, absinthe and alcoholism were also characterized as contributing to a general malaise and degeneration of the French population. This concern with societal degeneration was part of a generalized anxiety throughout Europe during this period. Social ills, so-called decadence, and racial mixing were often cited as contributing to the weakening of Western Civilization.Although these specters were used to justify absinthe’s 1914 ban, more recent work argues that the ban was part of an effort to promote France’s then-struggling wine industry. The issue of alcohol as a social ill would return in the interwar period, though not to the same degree as in the United States. When France went to war in 1914, troops were only issued water, but the army quickly began issuing a daily wine ration as early as September 1914. This consisted of pinard (sometimes translated as “plonk”), which was a low-quality red wine. Generally, poilus were issued with ½ liter of pinard per day, but this could fluctuate depending on the logistical situation. Soldiers were sometimes issued beer, cider, or brandy in lieu of pinard, but it remained the most common alcoholic drink consumed at the front. On special occasions, other drinks like spiced wine or sparkling wine would be issued. (In Gabriel Chevallier’s novelization of his war experiences, a bottle of sparkling wine was issued to every four men on Bastille Day). Pinard was sometimes mixed with brandy; some reports mention it being mixed with ether. Better quality wine, cognac, and other brandies were also widely available behind the lines, particularly in cafes and brothels catering to soldiers. British and American accounts of the war describe going out and consuming vast amounts of vin blanc (white wine) as a matter of routine during furlough. 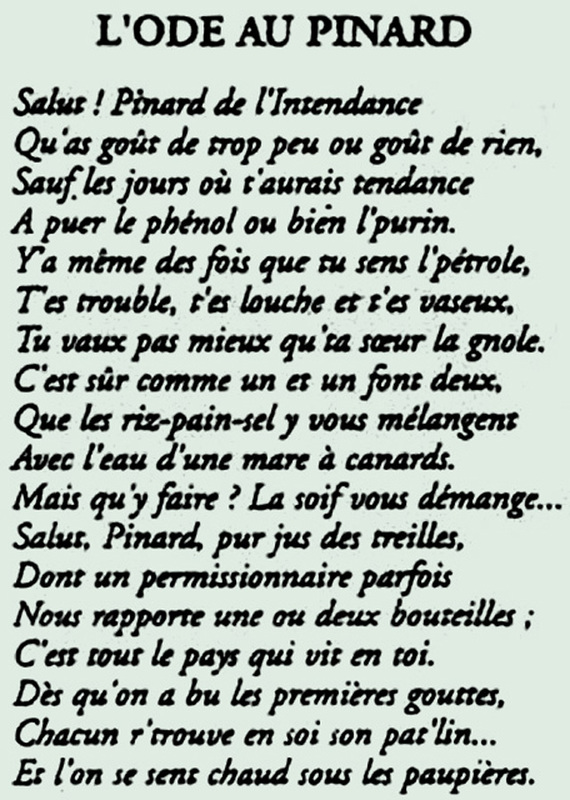 The “Ode to Pinard” by Max Leclerc was a marching song celebrating the virtues (and drawbacks) of pinard. This song describes the wine as having no taste except when it smells like petrol and manure. The song also derides the wine as impure, but ultimately accepts the wine since it was all that the lowly poilu could access. On the front, pinard became an essential part of France’s logistical operation. France imported wine in vast quantities and mounted a propaganda campaign to encourage civilians to conserve their wine for the war effort. The comforts of the poilu: pinard and shells. This 1916 photograph depicts a poilu standing in front of a large pile of artillery shells and a giant barrel of pinard attached to a railcar. 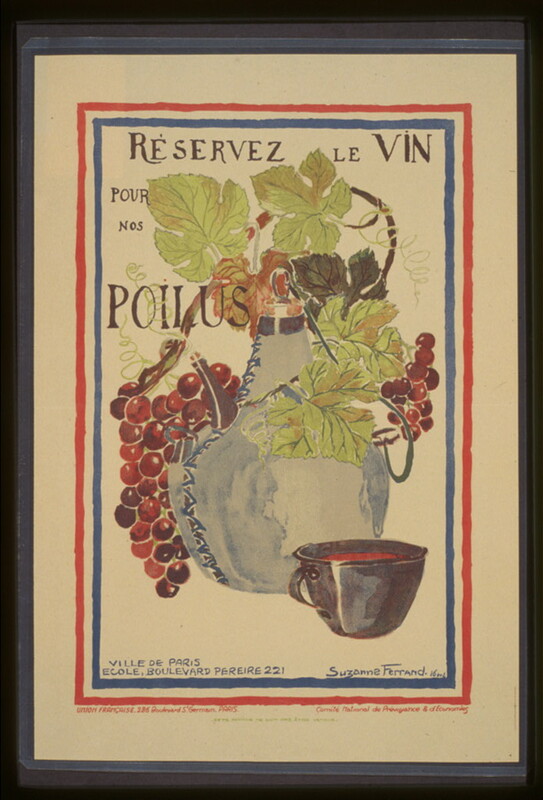 This 1916 poster encourages civilians to “save wine for our poilus.” It depicts a French army canteen and wine-filled mug surrounded by grapevines. Alcohol was a key part of the French war experience; it was part of daily life in the trenches. 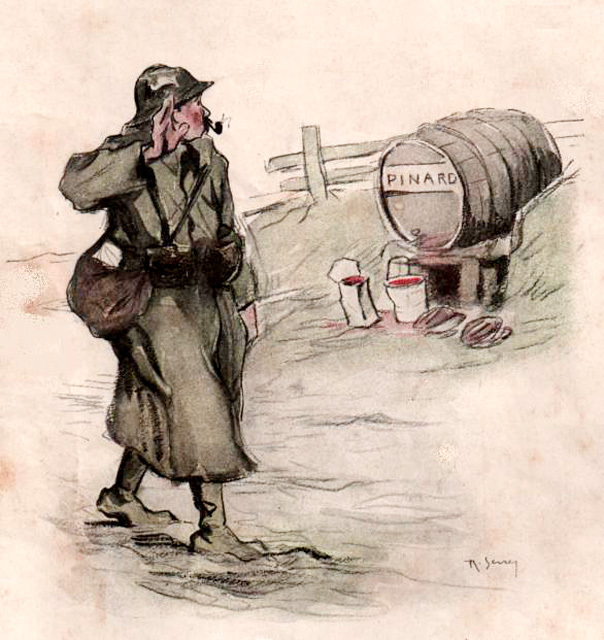 Alcohol remained ever-present in depictions of the poilu in popular culture, both during the war and in its aftermath. It formed part of the French national myth about the war through propaganda images and, later, specious claims about the war turning wine into France’s national beverage. It also contributed to the perception that social ills were exacerbated by the war. The war physically destroyed much of the wine-growing landscape, including areas in the Champagne region. Ultimately, as Max Leclerc’s “Ode to Pinard” indicates, wine was neither a source of national pride nor a threat to civilization. It was simply one of the few comforts available to poilus– one that helped them get through the day-to-day existence at the front. Part 2 of this series will focus on the British Army, alcohol, and a shift in tobacco culture stemming from the trench experience. Literally translated as “hairy one,” poilu is the French equivalent of terms like the British Tommy and the American Doughboy. Great post! There was a similar fear of racial degeneration caused by alcoholism throughout Latin America at the time. I’ve heard for long that wine was given to the Poilus to make them able to run in an open field exposed to German machine guns who killed them by dozens . Like the US commandment used amphetamins or other drugs among the GIs in Viet-Nam . The ubiquity of wine at the French front-lines during the World War I probably should not be surprising, but it is startling that troops were issued daily rations of wine. 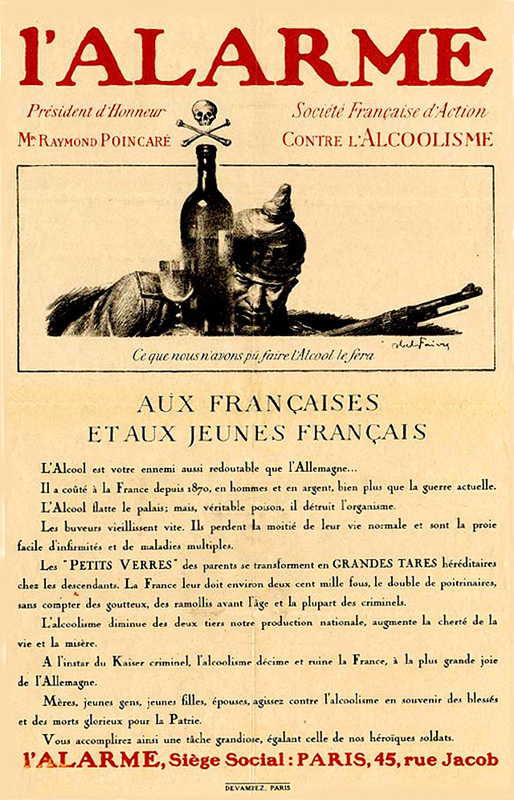 Rations were so plentiful that “current members of the wine industry” claim that these rations helped turn the French citizenry into avid “wine consumers.” Nicholas K. Johnson’s post at Points describes the role of alcohol and French military during World War I. Great article! Everyone commonly talks about how wars effect labor, the arts, and civilian technological developments, and it’s interest to get a glimpse into how it affects our imbibing as well.